This handy and easy-to-use (both for the child and the family), age-appropriate booklet supplements any first Eucharist preparation program that a parish offers. It provides the first communicant with her or his own guide to making the first Eucharist experience more meaningful. 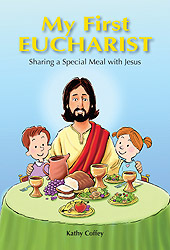 Attractively illustrated in full color, author Kathy Coffey helps the child to understand why the first communion day is special, how it is related to the story of Jesus’ eating with his friends at Cana and at the Last Supper, suggestions for things to do to prepare at home with family, a brief review of the parts of the Mass, and a brief explanation about what the Eucharist means. A helpful page Notes for the Parents offers ideas for how to get the whole family involved in the first Eucharist process.